“This new TCC-1200 has earned its 120-ton badge. 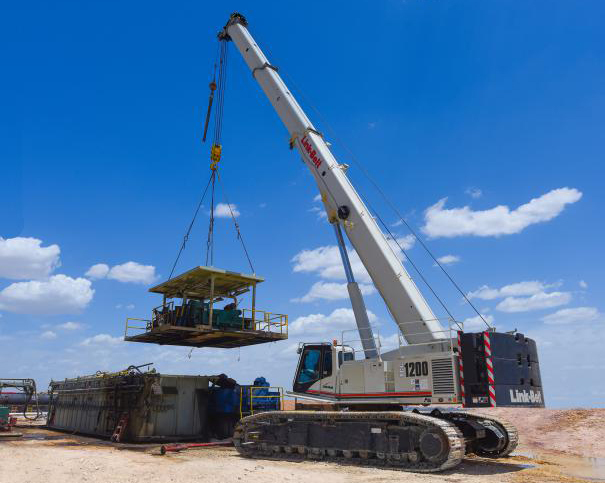 We tested and passed the new base rating at the same radius as the original 110-ton,” said Scott Knight, Product Manager for Lattice and Telescopic Crawler Cranes. The TCC-1200 offers an impressive capacity chart at radius that rivals even lattice crawler cranes with a similar base rating. The TCC-1200 is a full power boom, fabricated from ultra-high-strength steel and formed in Link-Belt’s own formed boom facility. The main boom height is 40 – 150 ft. (12.2 – 45.7 m) long and incorporates Teflon wear pucks to eliminate boom grease. It will come with three track widths – extended [18 ft. 2 in (5.5 m)], intermediate [15 ft. 8 in. (4.8 m)], and retracted [11 ft. 11 in. (3.6 m)] which offers varying footprint capability in popular telecrawler sectors such as energy, industrial, and infrastructure.